A little while ago I posted an article looking for bloggers in the Hindhead, Haslemere, Grayshott and Farnham corner of the world. A few people responded and met up in a pub in Haslemere, the White Horse. We now call ourselves, More Than Just Us... rather appropriate really, as 'more than just us' met up for the second time at a pub in Beacon Hill, The Woodcock. 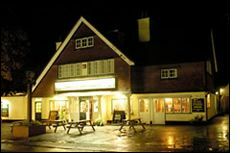 On Thursday of this week (22nd March 2007) we head to the Fox and Pelican in Grayshott, we'd welcome people to join us - you need only live in the local area, and have some interest in blogging! I love the thought of building interest groups that meet face to face - some things just can't be emulated in a virtual setting, and it's pretty lonely drinking beer in front of the computer! The inspiration for creating a group like this came from Tom Smith and his group of web developers and designers based in York who call themselves "We Are The Monkeys (hey hey!)." The getting together bit is cool enough, but the group didn't stop there and set about helping others in a Code-a-thon. The group designed a new website for a local children's charity. This is a fantastic achievement and with the collective talents of all involved have produced a website which would surpass all others. Ambitious? Sure, but I'd quite fancy doing something similar. Anyone up for it? I saw came across your blog somehow and I just wanted to say "hi". -All the way from Brunei, Rayn. Great to see you here. Welcome! A good friend of mine, Stephen Heppell has recently visited your country and found it ever so inspiring. He returned to the UK much encouraged about the future of learning. Hey that's great! I'm very proud of my country, I mean, who isn't of theirs? Excuse my English especially the grammar. English is my second language. I have alot of friends currently studying for their Undergrad Degrees in the UK. All of them are loving it there. I read of your latest entry on blogging through the phone. I have the same exact phone - k610i. That's one thing we have in common, I guess. I'll keep on visiting this blog, promise. There's now a Blog dedicated to the best businesses in Haslemere - http://www.thebestof.co.uk/local/haslemere/blog I think we should contribute, particularly recommending the best places to eat.